Hermione Granger is a muggle-born witch, the daughter of nonmagical dentists. She does not realize that she is a witch until she is accepted into Hogwarts, but quickly learns about the wizarding world through extensive reading. The Sorting Hat considers placing Hermione into Ravenclaw House, but because of her own preferences, it puts her into Gryffindor, the same house as Harry Potter, Ron Weasley, and Neville Longbottom. Despite being disadvantaged by learning about her powers later than some students, Hermione's study habits and love of learning place her at the top of her class. However, her know-it-all tendencies and adherence to the rules make her unpopular amongst the other students. Hermione is hurt when she overhears Ron making fun of her and cries in the girls' bathroom, not realizing that a Troll has found its way into the school. Going to check on Hermione, Harry and Ron end up rescuing her from the Troll and the three of them become friends when Hermione lies to teachers to defend their reckless actions. Through the rest of their first year, Hermione, Harry, and Ron attempt to discover what is hidden under a trapdoor guarded by a thee-headed dog on the third corridor. Harry and Ron fear that, whatever it is, Professor Snape plots to steal it. Hermione, reverent of the Hogwarts teachers, does not believe them until she catches Snape performing a spell on Harry at a Quidditch match. While accidentally bumping into Professor Quirrell, she sets Snape's flames ablaze to break his concentration. While relaying the incident to their friend Hagrid after the match, he accidentally drops that the item guarded by "Fluffy" is being protected for a man named Nicholas Flamel by Professor Dumbledore. 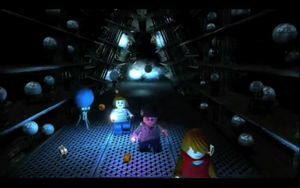 Hermione, Harry, and Ron scrounge the library for a mention of Nicholas Flamel to learn what Fluffy is guarding, though they find nothing until they learn he was an alchemist, to which Hermione pulls out a tome which references Flamel as the creator of a Sorcerer's Stone, a magical object which can create the elixir of life. After receiving detentions for visiting Hagrid too late at night, Hermione, Harry, and Ron receive detentions. Along with Draco Malfoy, they are sent into the Forbidden Forest to help Hagrid track a dying Unicorn. Harry comes across a hooded figure, supposedly Lord Voldemort, drinking the Unicorn's blood, but he is returned to his friends by the centaur Firenze. When the trio learns that the man who had given Norbert to Hagrid was interested in Fluffy and Hagrid had unknowingly divulged how to pass the dog, they fear that it was Snape and that he is planning to retrieve the Sorcerer's Stone for Voldemort. With Dumbledore gone and neither Hagrid or Professor McGonagall taking their fears seriously, Hermione, Harry, and Ron resolve to rescue the stone themselves before Snape can steal it. After they pass Fluffy by putting him to sleep with music, Hermione rescues Harry and Ron from Devil's Snare, a trap planted under the trapdoor by Professor Sprout, by using the same flames as she set on Snape's cloak. Though they are able to clear Professor Flitwick's challenge (flying keys), Hermione and Harry are forced to leave Ron behind when Ron sacrifices himself in a chess match with giant figures (created by McGonagall) so that Hermione and Harry can move along to Snape's challenge. Hermione is able to deduce which potion will get Harry into the next room, but as there is only enough for one person to continue, she allows him to confront Snape alone. Hermione retrieves Ron and, using flying broomsticks from Flitwick's challenge, return to the third floor. They rush to find Hedwig so that they can send a letter to Dumbledore, but they meet him in the Great Hall. Dumbledore retrieves Harry, who had faced Professor Quirrell, not Snape, and successfully prevented Voldemort from stealing the Sorcerer's Stone. Harry rejoins Hermione and Ron for the end of year feast where their bravery under the trapdoor helps Gryffindor to win the house cup. When Hermione and her classmates return to Hogwarts, the mysterious Heir of Slytherin opens the Chamber of Secrets, unleashing a monster which attacks Squibs and muggle-borns. Harry is suspect because the school learns that he can speak to snakes, a trait of Salazar Slytherin, and he hears voices in the walls which leads him, Hermione, and Ron to Mrs. Norris's petrified body. Knowing that Harry is innocent, Hermione and Ron suspect Draco Malfoy based on a prejudice slur he had called Hermione. Hermione comes up with the plan to brew a Polyjuice Potion which will let them assume the forms of Slytherins for an hour and find out if Malfoy is the heir. They brew the potion throughout November and December, finally using it on Christmas. While Harry and Ron transform into Gregory Goyle and Vincent Crabbe, respectively, Hermione, erroneously believing that she had one of Millicent Bulstrode's hairs, receives cat-like features. She hides in a stall in Moaning Myrtle's bathroom until Harry and Ron return, reporting that Draco is innocent and does not know who the heir is. Madam Pomfrey is able to set Hermione right. After several other attacks on students and no new leads, Hermione has a revelatory moment when she realizes that Harry hears the voice through the walls before attacks because the monster is a snake moving through the pipes and rushes off to the library. Tearing a page out of a book on Basilisks and scrawling "pipes" in her own handwriting, Hermione warns the first person she sees, Penelope Clearwater, to use a mirror to check corners so that they can make sure it is clear. However, Hermione and Penelope see the Basilisk and are petrified. While Harry and Ron are visiting Hermione in the hospital wing, they discover the page clenched in her frozen hand and are able to use the knowledge to find the Chamber of Secrets just in time to save the school. Hermione and the others who have been petrified are restored by a Mandrake draught Snape brewed. While visiting Diagon Alley with Harry and the Weasleys, Hermione adopts a large cat called Crookshanks with her birthday money. The cat seems initially adverse to Ron, and repeatedly makes attempts to get his pet rat, Scabbers. Ron insists that Crookshanks is not normal. Since Third Years are allowed to take electives, Hermione signs up for every new class, including Arithmancy, Muggle Studies (despite being muggle born), Divination, Study of Ancient Runes, and Care of Magical Creatures. During the latter class, which Hagrid has recently been appointed to teach, Malfoy insults and is attacked by the Hippogriff Buckbeak. Hermione promises to help prepare Buckbeak's case, adding to her heavy workload. When new Defense Against the Dark Arts professor Remus Lupin's Boggart takes the shape of a "silvery orb" when it sees him, Hermione recognizes it as the full moon and notices that Lupin is always missing on days when the moon is full. She deduces that he is a Werewolf, but, trusting Dumbledore's judgement, keeps this to herself. Crookshanks continually attacking Scabbers, plus Hermione's disapproval of Harry using secret passages to sneak into Hogsmeade when Sirius Black is on the loose, strains her friendship with Harry and Ron. After Harry mysteriously receives a broomstick for Christmas without a note, Hermione, suspecting that it is from Black, tells Professor McGonagall, who confiscates the broom to check for curses which may have been placed on it. This causes Harry and Ron to stop talking to Hermione altogether. She begins spending her free time helping Hagrid with Buckbeak instead. Harry and Ron's feud with Hermione lasts until she informs them that Buckbeak lost his case and has been scheduled to be executed. Hermione is so upset over the news that she punches Draco in the face when he insults Hagrid. On the day of Buckbeak's execution, the trio sneaks down to Hagrid's Hut beforehand. While there, Hermione finds Scabbers, who they had thought dead. When Dumbledore, Cornelius Fudge, and Macnair the executioner appear to execute Buckbeak, Hagrid forces Hermione, Harry, and Ron to leave. While Ron is wrestling to keep Scabbers still, he is attacked by a black dog and dragged under the Whomping Willow. Hermione and Harry run after them, finding Crookshanks, who freezes the Willow by tapping a knot on the tree. They follow Crookshanks through the tunnel to discover that they are in a secret passageway which leads into the Shrieking Shack. Ron is on a bed with a broken leg, and he warns his friends that Sirius Black, the man who betrayed Harry's parents to Voldemort, is an animagus who can transform into a dog. When Lupin appears, with the apparent intention of assisting Black, Hermione tells Harry that Lupin is a Werewolf. Lupin and Black attempt to explain that Black is innocent, while Black repeatedly asserts that he wishes to murder Scabbers. They claim that like Black's dog, Scabbers is a wizard in disguise; Peter Pettigrew, one of the men Black was accused of killing. Pettigrew was the one who betrayed Harry's parents to Voldemort, they say. Ron eventually gives up Scabbers, and he is transformed into Pettigrew. Hermione and the others resolve to take Pettigrew as a prisoner back to the castle so that Black's name can be cleared. However, as they head across the grounds, Lupin transforms into a Werewolf and runs off, giving Pettigrew a chance to flee. Black transforms back into the dog to keep Lupin from hurting the others, but Sirius is injured. Harry and Hermione make feeble attempts to hold a horde of Dementors off from attacking Black, but Hermione passes out. Later awaking in the hospital wing, Hermione and Harry are informed by Dumbledore, who believes their story that Black is innocent, that he is to have his soul stolen by the Dementors. He hints that Hermione should use her time-turner, a device which she has been using to attend all of her classes despite an otherwise impossible schedule, to save both Buckbeak and Black. Going back in time with Harry, the two of them are able to successfully rescue both Buckbeak and Black while remaining hidden from their past selves. Black escapes on Buckbeak, and Hermione and Harry are able to return to the hospital wing before anyone suspects a thing. Hermione and Harry join the Weasley family in attendance at the Quidditch World Cup. After the game, the campground is marched by Death Eaters, followers of Lord Voldemort, and Hermione flees into the forest with Harry and Ron until the demonstrators have passed and they reunite with the Weasleys. During this year, Hogwarts is the host of the Triwizard Tournament, welcoming students from Beauxbatons in France and Durmstrang in Bulgaria. The Goblet of Fire chooses a champion from each school to compete in three tasks. When Harry's name comes out of the Goblet as a fourth champion, despite being underaged, Hermione stands by him while Ron and the rest of the school vilify him as selfishly withholding how to fool the Goblet from them. Hermione helps prepare Harry prepare for the tasks by teaching him additional charms and jinxes outside of class. Hermione becomes annoyed when Quidditch celebrity and Durmstrang Triwizard champion Viktor Krum begins to spend time in the library, attracting hoards of girls whose swooning irritates Hermione, until she learns that Viktor is only coming to the library because he appreciates how different Hermione is different from other girls. Hermione keeps Viktor's interest in her a secret from everyone but Ron's sister Ginny until she shows up as Viktor's date at the Yule Ball. Before the Second Task, where Harry and the other champions will have to retrieve an object of their affection from the Merpeople, Hermione and Ron help Harry perform research on how he will breathe underwater, but they turn up nothing. The evening before, Professor McGonagall sends for Hermione and Ron, and they do not return later that night because they have been marked as Viktor's and Harry's "most treasured possessions," respectively, and cast into a magically induced sleep. Krum, with his head transfigured into a shark's, is the first to arrive at the Merpeople colony and rescue Hermione. After telling off gossip journalist Rita Skeeter for her shoddy ethics, Rita takes advantage of her being Harry's friend and Viktor's love interest to write defamatory and embarrassing articles painting Hermione as manipulative. Hermione wonders how Rita is listening in on private conversations, and eventually discovers that, like Sirius, Rita is an unregistered Animagus. Hermione manages to capture Rita when she has taken the form of a beetle, and reveals this to Harry and Ron when they make their homeward journey on the Hogwarts Express. When Cedric Diggory is killed by a returned Lord Voldemort after the Third Task, Hermione believes Harry's story. She joins the students from all three schools in mourning Cedric, and says goodbye to Viktor. Over the Summer, Hermione again stays with the Weasleys. However, not at The Burrow, but Number 12 Grimauld Place, Sirius Black's family home and headquarters for the Order of the Phoenix, an organization of wizards and witches resisting Voldemort. The rumours of Voldemort's return cause a fracture in the wizarding community, with the Ministry of Magic denying the possibility and accusing Harry of succumbing to celebrity. At Hogwarts, Hermione and Ron are made prefects. The Ministry appoints Dolores Umbridge as the new Defence Against the Dark Arts professor and begin interfering in school affairs to lessen Dumbledore's grip on the school. Without being taught practical defence, Hermione encourages Harry and other students to rebel by holding secret Defence Against the Dark Arts classes under the moniker of "Dumbledore's Army," or the D.A. for short. After Harry receives a vision of Voldemort torturing Sirius at the Ministry of Magic, Hermione convinces him to contact Sirius before they rashly go to rescue him. As Sirius is still wanted for murder and the fireplaces are all being watched, Hermione and Harry develop a ruse with help from Ron, Ginny, Neville, and their Ravenclaw friend Luna Lovegood so that they can sneak into Umbridge's office. However, they are caught, and Umbridge threatens to use the unforgivable Cruciatus Curse to torture Harry. Hermione objects, and quickly lies that the D.A. was building a weapon for Dumbledore which is hidden in the Forbidden Forest. Hermione leads her into the forest, where Umbridge insults and is assailed by Centaurs. 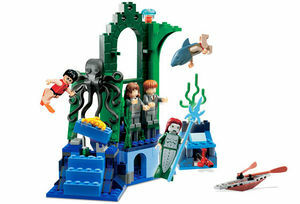 Hermione and Harry recoup with Ron, Ginny, Neville, and Luna, and, using Thestrals, embark to rescue Sirius. However, breaking into the Department of Mysteries, they discover that it was indeed a trap so that Voldemort could manipulate Harry into retrieving a prophecy for him. The students flee from Death Eaters, doing severe damage to several of the artefacts within the Department before the Order of the Phoenix arrives. As Ministry members begin to show up, Cornelius Fudge catches a glimpse of Voldemort and, realizing the severity of what they are facing, ends his smear campaign against Harry and Dumbledore. Hermione's academic prowess impresses Professor Slughorn, the new Potions Master, enough that she is inducted into the Slug Club. With Hermione and Harry as members, Ron feels excluded and becomes jealous. Hermione and Ron's friendship is further affected when he begins dating Lavender Brown, with the two of them obnoxiously declaring their affections. However, after Ron is poisoned by a drink sent to Slughorn, Hermione is very upset. Shortly thereafter, Ron breaks up with Lavender and their friendship resumes. Later in the year, while Harry and Dumbledore are hunting horcruxes (fragments of Voldemort's soul placed into protected objects), Hermione, Ron, and Ginny call for the D.A. to reform when Draco Malfoy finds a way for Death Eaters infiltrate the school. However, only Luna and Neville respond, being the only ones who check their beacons regularly. Joined by the Order of the Phoenix, they defend the Astronomy Tower. The battle ends in Dumbledore's assassination by Snape. At Dumbledore's funeral, Harry announces his intention to leave Hogwarts next year so that he can hunt the rest of Voldemort's horcruxes. Hermione and Ron assure that they will help him. Knowing that her muggle heritage and hunting horcruxes with Harry will make her a target, Hermione erases her parents' memories, convincing them that they are a childless couple with a dream of living in Australia. Hermione participates in removing Harry from his aunt and uncle's house as one of the six Order members who use Polyjuice Potion to disguise themselves as Harry. 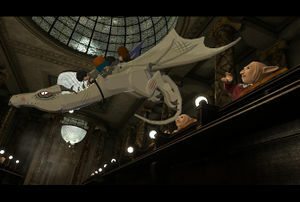 Hermione is accompanied by Kingsley Shacklebolt on a Thestral as they fly to the Burrow, briefly encountering several Death Eaters and Voldemort himself, but managing to escape. While at the Burrow, new Minister of Magic Rufus Scrimgeour arrives to fulfill Dumbledore's will, she was given an untranslated copy of The Tales of Beedle the Bard. Hermione attends Bill Weasley and Fleur Delacour's wedding, briefly meeting Viktor again, to Ron's chagrin. When Shacklebolt warns that the Ministry has fallen to Death Eaters, Hermione is already prepared and immediately disapparates with Harry and Ron to Grimmauld Place. After interrogating Mundungus Fletcher, they learn that he sold a locket Voldemort turned into a Horcrux to Dolores Umbridge. The trio form a plan to infiltrate the Ministry of Magic, with Hermione using Polyjuice Potion to imitate Mafalda Hopkirk. As Mafalda, Hermione is drawn in alongside Umbridge and Yaxley to orchestrate hearings Voldemort's regime has setup to incriminate muggle-borns. Harry (as Albert Runcorn) interrupts Mary Cattermole's hearing and attacks Umbridge. Hermione and Harry free the muggle-borns and retrieve the locket, making their escape with Ron. However, Yaxley manages to tag Hermione as they disappear, allowing him to find Grimmauld Place and forcing the trio to go on the run. The locket proves to make the trio and, especially the wearer, standoffish. This culminates when Ron questions Harry's leadership. When Hermione defends Harry, Ron becomes jealous and abandons them. Ron later reunites with Hermione and Harry when they retreat to the Forest of Dean, after a disastrous visit to Godric's Hallow where they were attacked by Nagini posing as Bathilda Bagshot. After a Doe Patronus led Harry and Ron to the Sword of Gryffindor, Ron uses it to destroy the locket. Following this, the trio make a visit to Xenophilius Lovegood, Luna's father, hoping to visit his daughter and to implore him about a rune he wore at Bill and Fleur's wedding, which Hermione had found while translating the book Dumbledore left her. Viktor had previously told them it was the sign of Gellert Grindelwald, but Xenophilius explains that it denotes the Deathly Hallows: a wand of tremendous power, a stone which can resurrect the dead, and an invisibility cloak which will work forever; three objects used by three brothers in one of Beedle the Bard's stories. After the trio realize that Luna is not there, though she should be on holiday, Xenophilius tells them that the Death Eaters have taken her because he had been speaking out against them in his magazine. He plans to turn Harry over to Voldemort, and summons the Death Eaters. Before escaping, Hermione allows the Death Eaters to see her and Harry (while hiding Ron to preserve his cover of being deathly ill at the Burrow), to ensure that Luna won't be hurt. Sometime after the escape from the Lovegood house, Harry accidentally triggers a taboo placed on Voldemort's name, alerting Snatchers led by Fenrir Greyback to their location. The trio attempt to escape, but are caught and brought to Malfoy Manor for questioning. When she sees Gryffindor's sword, Bellatrix Lestrange panics, believing that they had broken into her Gringotts vault where Snape had placed it for safe keeping. While Harry and Ron are placed in a cellar prison, Bellatrix tortures Hermione, demanding to know how they got the sword. Hermione resists, lying that the sword is an imitation, but she is knocked out by the time that Dobby arrives to rescue the trio, Luna, and the Malfoys' other prisoners so they can be taken to Bill and Fleur's house for safety. While at Shell Cottage, Hermione recuperates. She, Harry, and Ron scheme with the Goblin Griphook to actually break into Bellatrix's vault at Gringotts, suspecting that a Horcrux may be hidden there. Hermione uses the last bit of Polyjuice Potion to disguise herself as Bellatrix. Despite portraying an unconvincing Bellatrix and Griphook betraying the trio, they manage to escape with Helga Hufflepuff's Cup and escape on the back of a Dragon. However, since Griphook had stolen Gryffindor's sword, they have no way of destroying the Horcrux. Deciding that the only place left to look for Horcruxes is at Hogwarts (believing that Nagini is one, and that there is another), the trio set into Hogsmeade after dusk. They are attacked by Dementors, but an innkeeper covers for them with Death Eaters spot Harry's Patronus. Revealing himself as Dumbledore's brother Aberforth, the innkeeper takes the trio inside. A secret passage behind a portrait of Ariana Dumbledore reunites the trio with Neville, who has been leading a reinvigorated Dumbledore's Army out of the Room of Requirement. With Harry, Ron, and Hermione back, Neville decides that the time is right to strike, and allies from outside of Hogwarts begin to arrive. 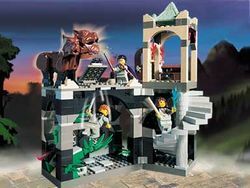 While Luna leads Harry to Ravenclaw Tower so that he can learn what Rowena Ravenclaw's diadem looked like, Hermione and Ron return to the Chamber of Secrets to retrieve Basilisk fangs. Hermione destroys Hufflepuff's cup before leaving the chamber. After reuniting with Harry, Hermione kisses Ron, but Harry reminds them what is at stake. 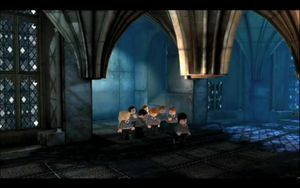 They search for Ravenclaw's diadem in the Room of Requirement, which had been allowed to change form now that the D.A. has left it. Though they are able to locate the Horcrux, they are ambushed by Draco, Gregory Goyle, and Blaise Zabini. Goyle causes the room to alight with a cursed fire which both swallows him and destroys the diadem. The trio help Draco and Blaise to escape. As they leave the Room of Requirement, they witness Fred Weasley's death. With the Battle of Hogwarts underway, the trio search for Nagini so that they can destroy the last Horcrux. Hiding under the invisibility cloak, they find Voldemort and Nagini in the boathouse with Snape, and witness Nagini kill Snape. Following this, Voldemort orders a temporary ceasefire, hoping to coerce Harry into surrendering himself. Harry disappears from his friends. Hermione is later shocked when Hagrid emerges from the Forbidden Forest, cradling what seems to be Harry's lifeless body. As Voldemort revels in his victory by announcing his plans to rebrand the Hogwarts crest with only Slytherin's Serpent, he sets the Sorting Hat ablaze over Neville's head as a symbol. However, Neville pulls Gryffindor's Sword from the hat and decapitates Nagini. With this show, the battle renews, and Hermione joins Ginny and Luna in dueling with Bellatrix. When Bellatrix nearly kills Ginny, Mrs. Weasley orders the girls to step aside and, after being taunted over Ginny's attack and Fred's death, kills Bellatrix. In the chaos, Harry rises, revealing that he is alive, and confronts Lord Voldemort for the final time, and Hermione witnesses as Harry emerges victorious. Following the Battle of Hogwarts, Hermione marries Ron and they have two children, Rose and Hugo. Hermione begins working for the Ministry of Magic as an activist for the rights of muggle-borns and magical creatures such as house-elves. 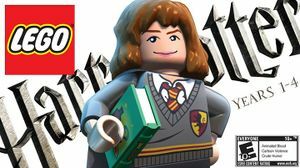 In LEGO Harry Potter: Years 1-4, Hermione has her first hair-piece, her second flesh variation face, a black cape, her first variation robes recoloured dark-grey, a blue book, and a brown wand. In Years 5-7,Hermione appears in her 2010 redesign, with longer, less bushy hair and her 2010 face. Her spells and abilities include: Wingardium Leviosa, Crookshanks, her bag with an Undetectable Extension Charm placed on it, Diffindo, Lumos Solem, Aguamenti, Expecto Patronum, and Reducto. Her known variations are: Snow Outfit for Godric's Hollow, her Hogwarts Uniform, her striped sweater (Order of the Phoenix) her casual outfit (Deathly Hallows Part 1) and her red jacket seen also in years 1-4. She has a book like in Years 1-4. 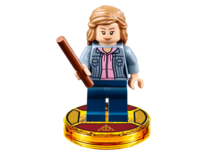 Hermione Granger also appeared in 3862 Harry Potter Hogwarts, a LEGO Game, as a microfigure. 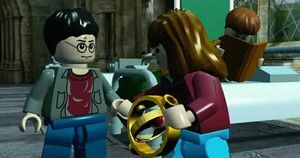 In LEGO Harry Potter: Years 1-4, her appearance is from the 2005 Re-design instead of 2010. Hermione Granger has a double printed face in the new 2010 re-released theme; one side has a smile, the other has a frown. In the Goblet of Fire and Order of the Phoenix sets, she had a different double sided head; one side was a half-smirk smile, and the other was sleeping. In 10217 Diagon Alley, she has the same torso that Ginny Weasley has in 4840 The Burrow. Hermione in her pink dress, this outfit is exclusive to LEGO Harry Potter: Years 5-7's DLC. This page was last edited on 16 February 2018, at 23:04.